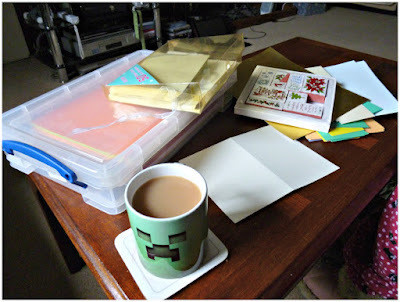 I went 'home-home' last week to visit my mum and brother, seeing as I had a bit of free time. I wouldn't say I regretted it, but it became apparent very quickly to me that I've outgrown the house of my parents. There was just something weird about it, I felt out of place. Maybe more on that in a later blog post, though. Unbeknownst to me, we'd been booked in for dinner with the grandparents I haven't seen in a few years. My mum asked if I'd got them a Christmas card or present and said that she hadn't either so I'd have to make one. Oh and by the way we're leaving in an hour so I'll have to make it quick. Surely it reaches a point (like February) when you can just cut your losses and forget about Christmas cards, but she was quite insistent. Luckily for me, I found this pair of crimping scissors and set of rubber stamps in the cupboard that I never knew we had. I have no idea where they came from, and they needed a good wash beforehand. The ink pad was all dried up and I didn't have my craft supplies with me so I experimented with using felt tip pens instead. I found one that took longer than the others to dry which was perfect. 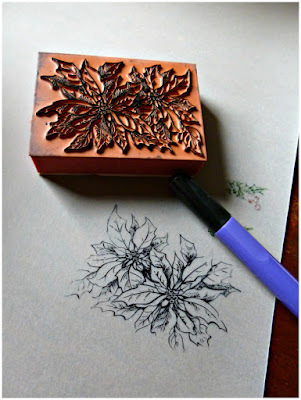 I had to work quickly to cover and stamp the thing before the ink dried and went patchy but the poinsettia stamp looked really pretty like that, so I decided to use that one on my card. Using some shiny gold paper as the main background, I made a really simple Christmas card. Using the snowflake stamp multiple times on some blue paper, and the poinsettia stamp on a bit of crimped ivory card, I layered them at slightly jaunty angles. 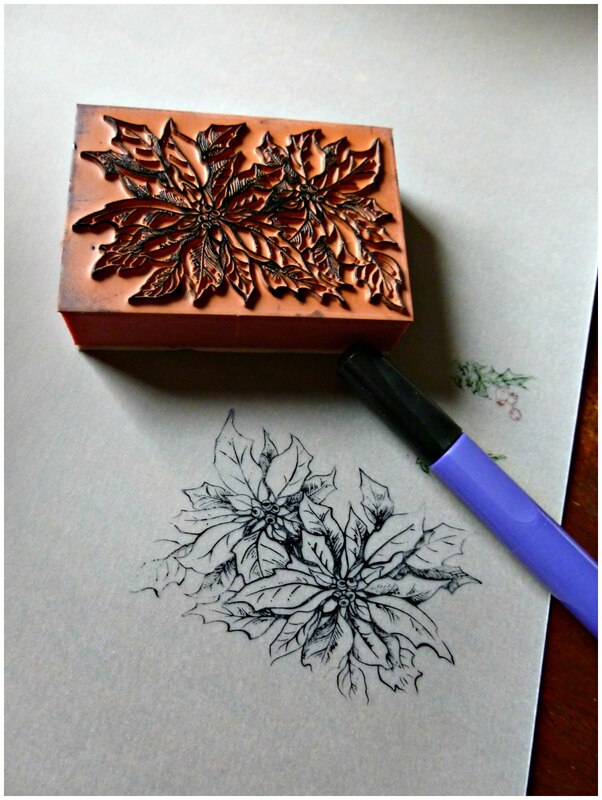 Unfortunately the poinsettia stamp didn't come out as nicely as I wanted in the final version because I'd practised on a different type of paper. 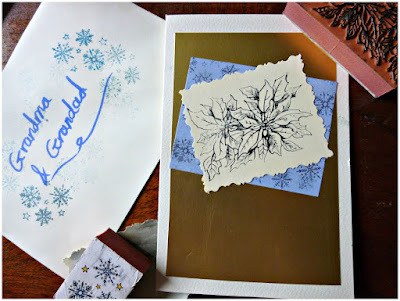 I also used the snowflake stamp again with a blue felt tip to make a matching envelope. 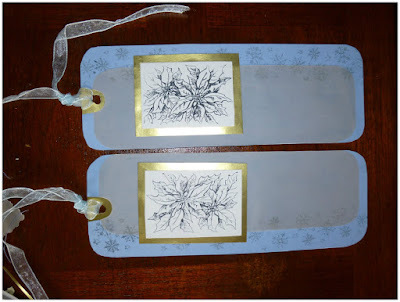 Also, these matching bookmarks! 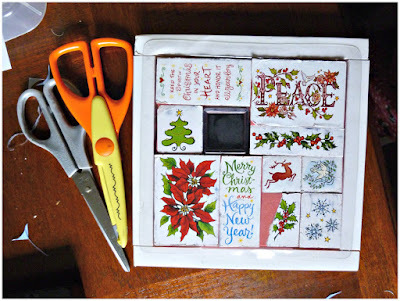 Made with the same materials as the card with the addition of a hole punch and some ribbon. They were starting to curl up quite badly so I sandwiched them between some heavy books as they dried. I know that home-made paper bookmarks are something you usually get little children to make and give to people, but I don't see why they can't be refined a little for a more mature audience. I was really out of ideas and time, too. And there we have it! A 30-minute(ish) solution to a family argument. (With my mum, not my grandparents. They wouldn't have minded either way. It's sometimes just easier to give in to what people want, though.) The visit itself went surprisingly well, it was nice to catch up. My grandma also makes amazing roast potatoes, and that made everything worth it. Why Do Tigers Wear Stripes?